Photograph from the Curzon Collection, of a zat pwe in Burma (Myanmar), taken by Watts and Skeen in the 1890s. A zat pwe is the most popular of several different types of pwe, a generic Burmese term for traditional theatrical performances encompassing plays, dramas, musical operas and classical dance. The zat pwe combined music, dance and drama into a play with a religious theme and was staged during pagoda festivals and by travelling troupes in rural villages. 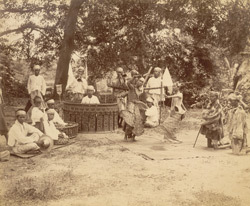 This view shows a pair of classical dancers, who are supported by a band of musicians playing a variety of percussion and wind instruments which typically make up an outdoor ensemble or hsaing. These include bamboo clappers, cymbals, flutes, and drums. The circular frames in which two musicians sit are drum and gong instruments.